The morning of the second day of any holiday abroad is a tiny golden window in which you firmly believe you are a god. Having made it through the various circles of the hellish first day and come out the other side intact, you are convinced you can do anything. You are utterly familiar with your surroundings. You are a compass on legs when it comes to the navigation of sidestreets. You have become fluent in the language overnight, you are suddenly one of the place’s leading culinary experts, and you are ready to give the best guided tour that any confused newcomer has ever had the misfortune of experiencing. You are invincible. This window of invincibility lasts for roughly 45 seconds once you step out of range of the hotel. My plan today was a very simple one – explore Köln’s Ludwig Museum, find a bookshop that I’d seen the previous day, and hunt down a satisfying dinner somewhere in between. Ultimately I succeeded in every aspect, but not without a great deal of trouble. All of which made the day much more interesting than I had anticipated. The first issue was the weather, and its headwrecking changeability. Backtracking on its promises (meteorologically-speaking) with more fiendish enthusiasm than the Labour Party, it was sunny, raining, dull and sunny again within the space of about 20 minutes. I lost a good deal of time from the start of my excursion frantically switching outfits like a bad actor in a one-man play. Once I settled on an eccentric fashion of light shirt plus substantial rainjacket, I chugged towards the cathedral, the centrepoint at which my awareness of the whole city is anchored. On the way I was questioned by another tourist in search of a supermarket – and to my horror I discovered that I had not yet seen one in the city centre at all. Köln, for all its excellence, seems to be missing some basic things; a straight-up Supermarkt, for instance, or a simple bookshop, or an art supplies store, or even a cinema. I will have to keep my eyes wide open for any signs of these bare necessities on future days. 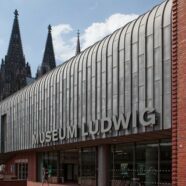 At a very short distance from the back of the cathedral is the Ludwig Museum, a large building of red brick with a high convex metal roof like the crest of a cartoon wave. The Ludwig Museum is Köln’s major modern art gallery, which houses both permanent collections and special touring exhibitions at different times of the year. Anyone under the age of 18 has free admission to the permanent collection but must cough up for entry to the visiting exhibition. Judging by another complication I experienced today, it seems visitors would be best advised to leave their bags (except for very small ones) in the lockers provided in the atrium. There are roving security guards who blend into the decor like ghosts but who will stop you from entering the gallery if you do not comply with these rules on admission fees and luggage. I only visited the two floors of permanent collections, but this was quite enough to occupy me for a fascinating two hours. There are collections including German Expressionism, New Objectivity and international pop art, and the Museum features great works by Andy Warhol, great works by Picasso and, well, whatever it is that Kandinsky was trying to do. On the ground floor one will find a shop full of expensive hardback books on artists from Dali to Yoko Ono, an assortment of beautiful postcards, and small pencils sold individually for €2, because, um, “art”. There is also a restaurant which in fairness serves excellent food, and is complete with multiple baby grand pianos ready to be played by the more adventurous guest. The view from the rooftop terrace is sublime, and the gallery as a whole is a charming, if slightly costly, way of passing a few hours. Having eventually finished with the Museum I went in search of the Hauptbahnhof (a word which here means “bewilderingly big train station prone to pandemics of pick-pocketing at nighttime). It was in this train station, situated a mere few minutes from the cathedral, that I first spied the coincidentally-named “Ludwig”, a massive two-story bookshop and so far the only Buchhandlung that I’ve succeeded in locating in Köln. The shop boasts immense collections of original German literature, fiction and non-fiction, and translated fiction from around the world. There is also a section of books in their original English (not that I spent half an hour looking at that particular section at all, absolutely not, that would be cheating). Scattered about the bookshop are comfy seats on which one can peruse potential purchases at leisure (and/or eavesdrop on everybody in the hope of learning some new Deutsch). To my delight I found a German translation of Agatha Christie’s classic “Murder on the Orient Express”, and left satisfied, but exhausted. Overall it was quite a satisfying day out, but I can’t help but notice that some of the city’s less-than-ideal aspects are nosing their way to the surface. But there are many more days to come, and I am confident that all will work out well in the end. I still have much to learn and all of it is exciting.